Fall Fest weekend 2015 features the return of the GO BO! Foundation Bake Sale. If you didn’t stop by Al Johnson’s in Sister Bay last weekend when the sale began, you definitely want to get there this weekend! The sale will run from 9am-5pm on Friday, Saturday and Sunday, Oct. 16-18, 2015. 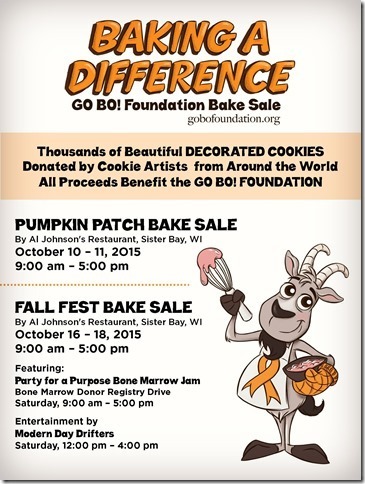 Choose from thousands of cookies decorated and donated by cookie artists from around the world, with all the proceeds benefiting the GO BO! Foundation. The Modern Day Drifters will provide live music during this cookie event on Saturday from noon to 4pm. If you don’t know about Bo, please take a moment to visit the GO BO! website and check out this recent interview with Bo’s mom Annika. Need help finding Door County restaurants like Al Johnson’s and hundreds more? Download the FREE Door County Chefs Mobile Dining Guide App for iPhone or Android, and find what you’re hungry for on the Door Peninsula!